Serving the family fresh, home-cooked food is a priority for my partner and I but we freely admit to a bad case of supermarket fatigue. At the end of a long day, finding that offerings aren’t as fresh as we’d like and having to make do on the run is becoming a reality for many of us. How then to bridge the gap between time-poor parents and providing the best food for the family? Sydney-based Box Fresh has answered our culinary prayers, delivering the freshest in-season food to your door with gourmet flair. Chef Greg Everett arrived from the UK in 2004 and started Box Fresh when the tough night hours of his job curtailed the time he spent with his new love. Mikala and Greg put their heads together to come up with a venture which suited daytime hours and incorporated Greg’s passion for food. Far from your usual fresh food delivery service, you’ll find a sprinkling of exotic goodies in your Box Fresh box. As I write, chestnuts have just arrived! You’ll receive fresh herbs as well as necessary staples, and there’s a wealth of storage tips and recipes on the Box Fresh site so you’ll know just what to do with the more unusual ingredients. There are two ‘Mum and Baby’ boxes with less citrus and more pear and melon($35 and $49) plus the regular mixed boxes starting at $35 delivered to your door! Babyology readers are just so dang lucky! 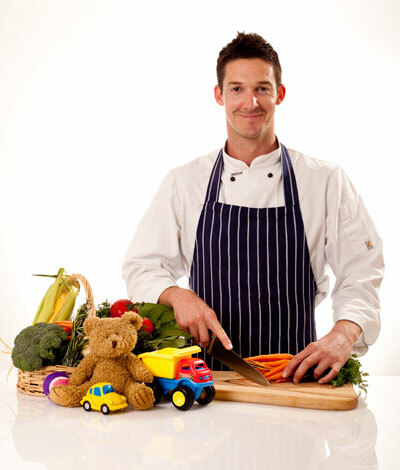 Greg has named a vegetable of the month and given us an exclusive recipe to try that’s a perfect finger food for older babies and toddlers. Have fun with it! Greg’s vegetable of the month for June is the sweet potato. Sweet potatoes are an excellent source of vitamin A, vitamin C and manganese. They also contain vitamin B6, potassium, iron, copper and dietary fibre. If you are starting baby on solids, then much needed iron is readily available in this great vegetable. The vitamin c will set your little one in good health to ward off any nasties too, with winter closing in and colds and snivels all the more prominent. 1. Pierce a whole sweet potato with a fork, then place on a paper towel and microwave on high for around 5 minutes. Let the potato stand a further 5 minutes and it will continue to cook. 2. Cook the salmon (no medium rare here, the fully cooked fish mashes more easily). 3. Add the salmon, vegetables and cheese to the cooled sweet potato and blend together. 4. Make small rectangle croquettes in your palm or get creative with your kids. You can cut out shapes with cutters or go freestyle! 5. Roll the croquettes in the flour, you will need to be far more skilled with your more elaborate shapes though. 6. Heat the oil in a non-stick pan and gently place croquettes in the pan. 7. Cook until golden brown on each side, remove and drain on absorbent paper. If you are cooking these once the mixture has cooled or with a mix made earlier, you may also need to heat in the oven as with standard fish fingers. Tip: Even grown-ups will like this one if you make more mixture and add some salt and pepper to the mix. Try them with salad and some lime aioli or garlic mayo. They will also freeze well for a month. NOTE: Please consult your doctor before you introduce any of our baby food recipes, or any new foods, to your baby. The information given here is for guidance only and does not replace professional medical advice. We’d love to hear comments from you about similar services in other Australian cities and if food features are something you’d like to see more often on Babyology.